This week’s action in the NFL was a rare instance of more excitement with uniforms than their college counterparts. 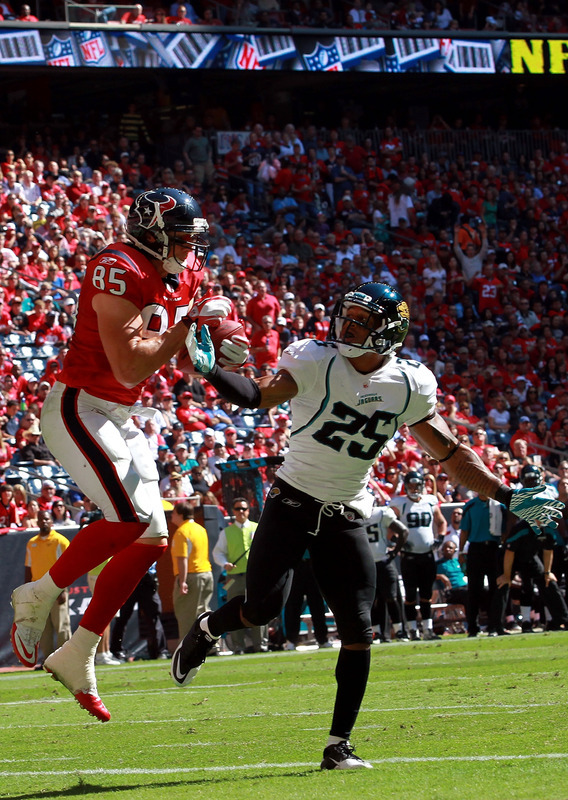 It starts with the Houston Texans who used their alternate red in a victory over the Jacksonville Jaguars. The best part of this was not the jersey itself, but the fact that the rest of the stadium went along with this red revolution. Houston must have gotten the word out to its fanbase of the uniform change because just about every fan in Reliant Stadium was going right along with their Texans in their red jerseys. Even the end zones had a red shadow to the letters instead of the usual blue. Other teams, like the Jets, go with their alternate uniforms without changing anything else about their surrounding area. The Texans got it right in this case with a total feeling of red throughout Reliant Stadium. The look isn’t good or bad, but just average. I prefer the normal blue uniform to this red look, but was very happy to see the rest of Houston going along with their team in the alternative direction. Usually this color coordination is seen in the NHL and NBA playoffs. It seemed like just about every team in the NBA decided to go with this cool television effect this past postseason. The Heat are known for their white outs including the white drapes over the empty courtside seats. The Rams went back to their glory days in the uniform department and on the field as they went to throwbacks for an upset of the Saints. 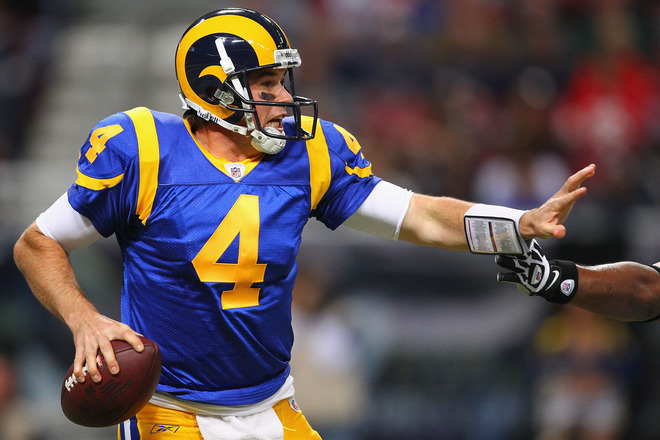 These uniforms are the best the Rams have ever worn, it was great to see them used again. Carolina continued to employ its powder blue home jerseys. It makes me wonder if these have become the primary uniforms for the Panthers. The Broncos also went with their alternate orange uniforms. The orange harkens back to the Orange Crush and John Elway days. The look is a bit jarring at first, but I think it definitely works for Denver.